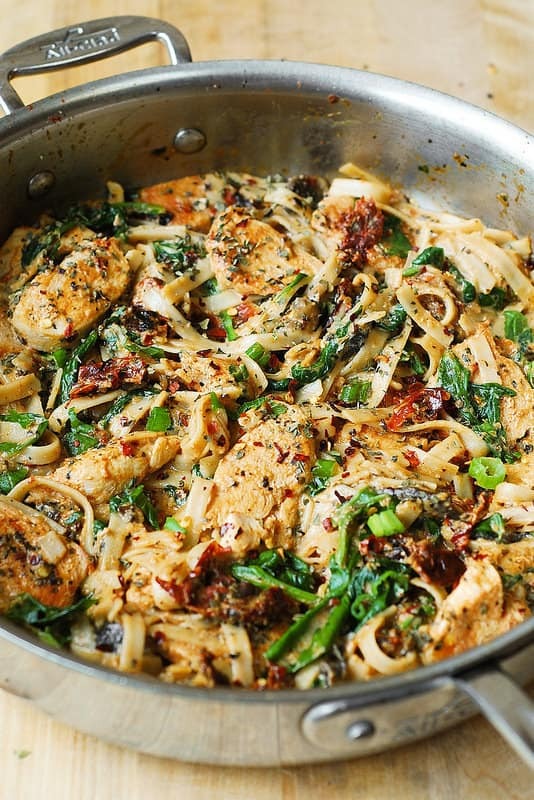 I have a great recipe for you: Chicken Pasta with Sun-Dried Tomatoes and Spinach in a Creamy Cauliflower Alfredo Sauce. It’s a healthier version of a regular fettuccine alfredo: instead of the usual alfredo cream sauce this pasta is coated with creamy, silky, healthy, low-calorie, and low-fat cauliflower sauce – all made with healthy and natural ingredients! I made this dish for dinner one night, and my husband could not even tell that there was cauliflower in the sauce. He thought the dish was very flavorful – that’s why you couldn’t even tell there is cauliflower – all you can taste is lot of great flavors, such as sun-dried tomatoes and basil, wonderfully blended together in some sort of delicious creamy sauce. 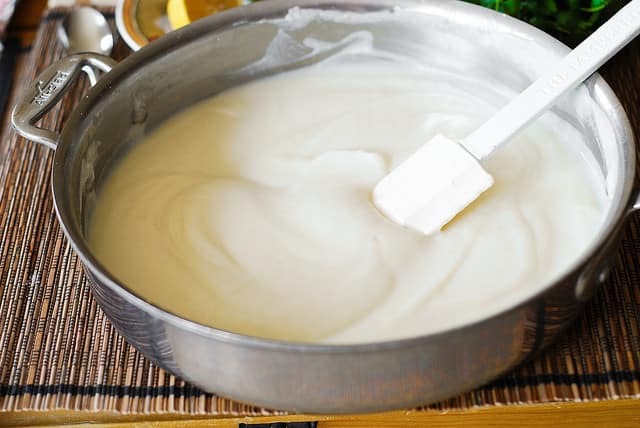 But we know it’s not just “some sort of delicious creamy sauce” – it’s healthy, low fat, low calorie, gluten free, made-completely-from-scratch creamy cauliflower alfredo sauce! What’s even better, you can make this creamy cauliflower alfredo sauce a day or two in advance, because it refrigerates really well and reheats beautifully too. Healthier version of a regular fettuccine alfredo. 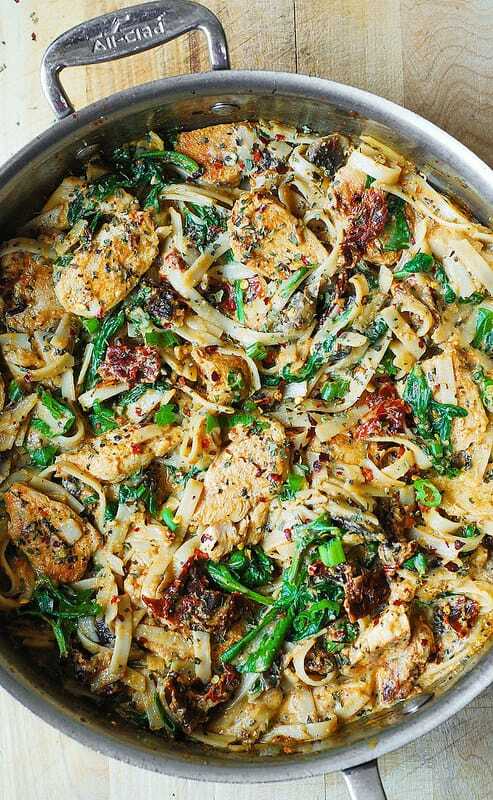 Low-calorie, low-fat cauliflower alfredo sauce mixed with sun-dried tomatoes, basil, spinach in this delicious chicken fettuccine pasta recipe. Drain sun-dried tomatoes from oil and chop them into smaller bits. In a large pan, heat 2 tablespoons of oil (reserved from the sun-dried tomatoes jar) on medium-high heat and saute garlic, chopped sun-dried tomatoes (drained from oil), and thinly sliced chicken breast (lightly covered in about ½ teaspoon of paprika, for color) for 2-3 minutes until chicken is cooked through, turning it over a couple of times. Sprinkle the salt over the chicken and more paprika while cooking. Remove from heat. Immediately add fresh spinach, cover the skillet with the lid, and let everything rest off heat, until spinach wilts. Cook pasta according to package instructions. Reserve some cooked pasta water - at least 1 cup (even though you will likely not use it all). Drain and rinse the pasta with cold water (to stop cooking). Add 1 cup cauliflower sauce and 1/4 cup reserved cooked pasta water to the chicken and sun-dried tomatoes. Add 1 tablespoon basil, 1 teaspoon paprika, and 1/4 teaspoon crushed red pepper. Mix with the sauce and add more salt and crushed red pepper if needed. 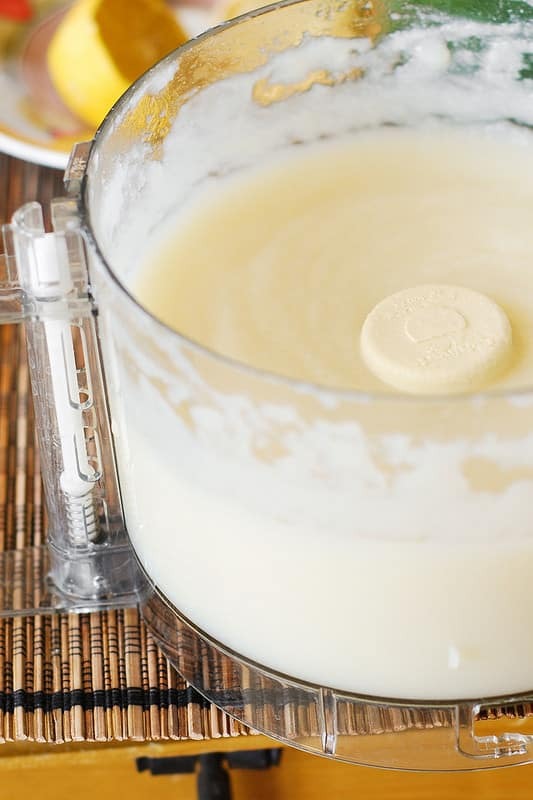 At this point, you might have to add more reserved cooked pasta water because the creamy sauce will be too thick (do not add all water at once - you might need just a small mount). Again, taste and season the pasta with more basil and salt, if needed. Add more paprika if you want your sauce to have a nice red-ish color. I made this last Friday for family, my cousin’s husband recently had surgery to repair an aneurysm so he is looking for alternative ways to prepare meals and I felt this would fill that requirement. O M G. They called this “five star”. 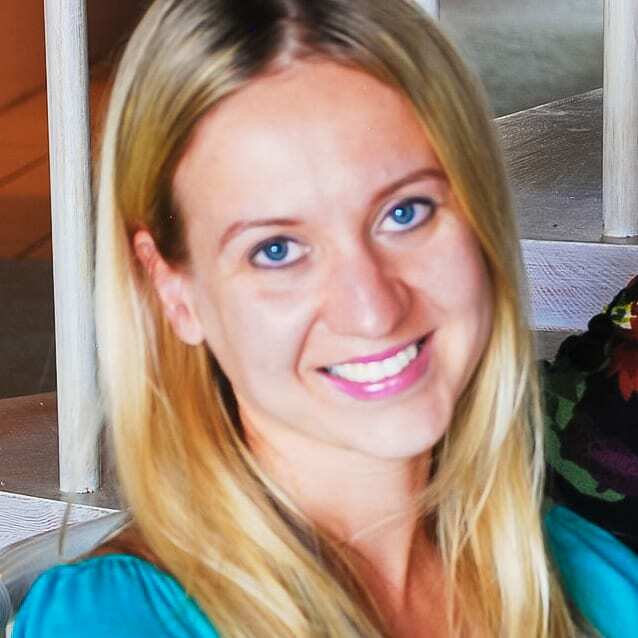 It looked exactly like your photo in this link and everyone enjoyed it very much. We paired it up with a Caesar salad and some artisan bread. Just delicious! Thanks, I have never used cauliflower for anything and am personally not that fond of it myself but when I tasted that Cauliflower Sauce I know I will be able to use it for many flavorful meals to come. Made this for dinner tonight, I was very skeptical of how the sauce would taste, I should not have been. This was one of the best meals I have made in a long time and that sauce was to die for. Thanks for a wonderful recipe. Of wow, that would keep me happy all week — what a perfect mid winter comfort dish! I love Fettuccine Alfredo, but if I eat too much, there’s too much of me. 🙁 So I love the idea of subbing cauliflower sauce. Very creative — thanks.